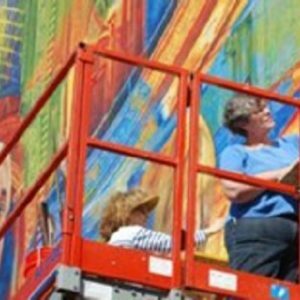 My art practice has combined creating community based public art murals, oil paintings, mosaics and sculptures with organizing Friends of Community Public Art (www.fcpaonline.og). I strongly believe that visual art can have a profound effect on the way a population feels about itself, which ultimately can transform the collective culture of that group. The community and labor union public art I create tell the often forgotten stories of the lives of ordinary people, their history, struggles and hopes. My artistic style combines realistic elements inspired by the Italian Renaissance with imaginative compositions and color schemes. I developed the tall mosaic covered column to support life-size sculptures. In both cases I strive to create a modern form of realism to which people respond.